That was a cutting-edge debate in 1996! Fast forward ten years, and it was no longer a question of whether or not to get a computer, but rather which computer—and did you want a desktop or a more portable laptop? Boomboxes became iPods. iPods became smartphones with streaming music and augmented reality games like Pokemon GO. And for a moment in time, corporate giants like Microsoft, Dell, and HP dominated the technological landscape, and the second you turned around, Apple or Sony or Samsung was making the front page of TIME magazine. One thing has not changed in all of the years since Johannes Gutenberg banged out the first book on his printing press over five hundred years ago: authors need to be—and have usually been—well ahead of the technology curve. And today, the new frontier is not necessarily some innovative piece of hardware that will change the way we read forever but rather a whole host of hardware and software developments that an infinitely diverse readership adapts to its infinitely diverse wants and needs. Finding a way to keep ahead of that curve in the modern age—an age where readers want to access their books not just on their physical bookshelves but also on their home computers, their dedicated e-readers or tablets, their smartphones, and their car stereos—means that authors must create digital editions of their books that can translate across devices and platforms. Every major online retailer of these Books, from Amazon to Barnes & Noble to the Apple iBooks store, has its own customized app to make book buying a snap. To muddy the waters still further, libraries are beginning to get into the game by developing additional apps, and PDF versions can often be read through the multipurpose Adobe Reader app. Because these apps are proprietary, authors may have to convert their books to a number of different file formats in order to sell them through all these retailers. You can imagine that this is a lot of work, work that relies on a certain specialized set of computer skills. Some authors may be adept at file conversion, but for many authors this is simply beyond the pale. Fortunately, you don’t have to go it alone: we here at Outskirts Press want to put the full power of digital editions into your hands—because simply put, you deserve the best possible exposure! And there’s no better way to reach new readers than to meet them where they live (metaphorically speaking) by providing an eBook in the correct file formats for their preferred reading experiences. We want to make the whole transition to digital as painless as possible for you, which is why most of our one-click packages include an eBook option. 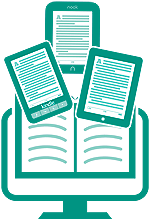 Even if you have already published your book and didn’t choose a one-click package, Outskirts Press offers several ways to add an eBook edition of your book, for the Kindle, the Nook, or the iPad/iPhone. Or save $198 when you go “Elite” and get all three with the click of a button. Yes, this button right here!